The hubby and I ran the Rock 'N' Roll Los Angeles Half Marathon on Sunday morning. 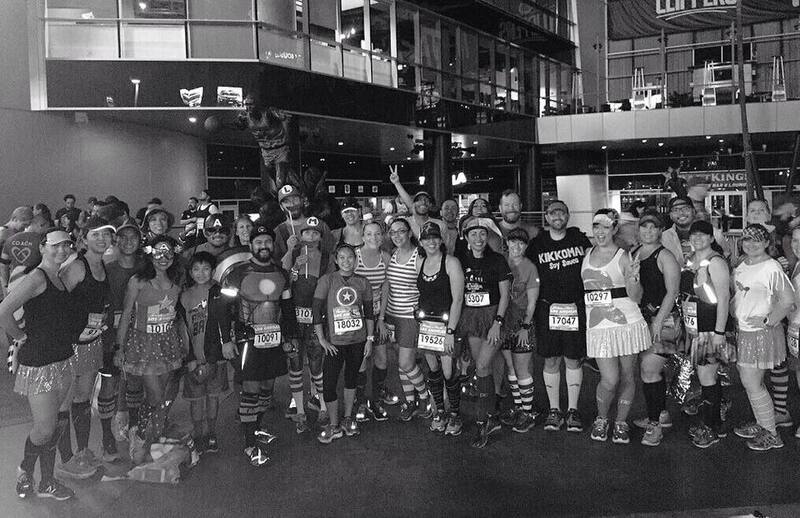 This was our second year running this race and we had even more fun (if that's even possible) than last year. 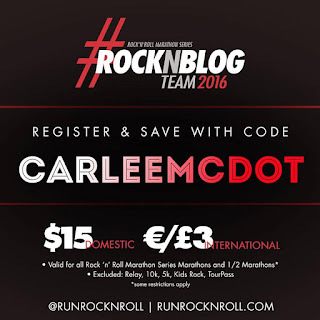 run AND save $$, use "CARLEEMCDOT" when registering! But, before the race shenanigans, let's get into the LA shenanigans. So, as a Conqur Endurance Group Ambassador, it's appreciated if I can volunteer for a couple shifts throughout the year at race expos that are promoting the races. 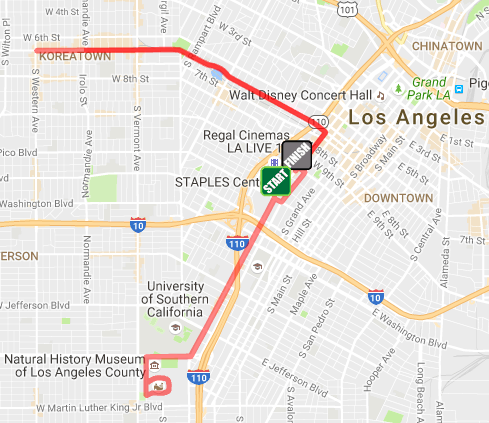 Since the hubby and I were planning on staying in a hotel up in LA, I figured this would be a perfect volunteer shift to take (otherwise it normally takes 1.5-2 hours to drive each way which can be rough to only work a couple hour shift). Little did I know that around the Convention Center/ Staples Center the world was gathering! Legit, there seemed to be five bazillion people in the area... which made the drive take upwards of 2.5 hours from our house AND I ended up having to walk the final 1-2 miles to the Convention Center because the traffic was deadlocked! Some of the Conqur Endurance Group Ambassadors! My volunteer shift was from 12:30pm - 5pm. While I was 'lubing the deals', the hubby was out rock climbing. He got back to the Expo around 4:40pm, just in time for us to print off our waivers, grab our bibs and shirts, and start helping the crew tear down the booth. (Can I just say, if you have never seen how quickly vendors can tear down a booth, you're missing out! That hall went from booming at 4:59pm to an empty room by 5:17pm. INSANE IN THE MEMBRANE!) PS I need to give a BIG SHOUT OUT to all of the folks who came and said "hi", introduced themselves, took selfies, registered to #ConqurLA, etc! YOU ALL ROCK MY SOCKS! 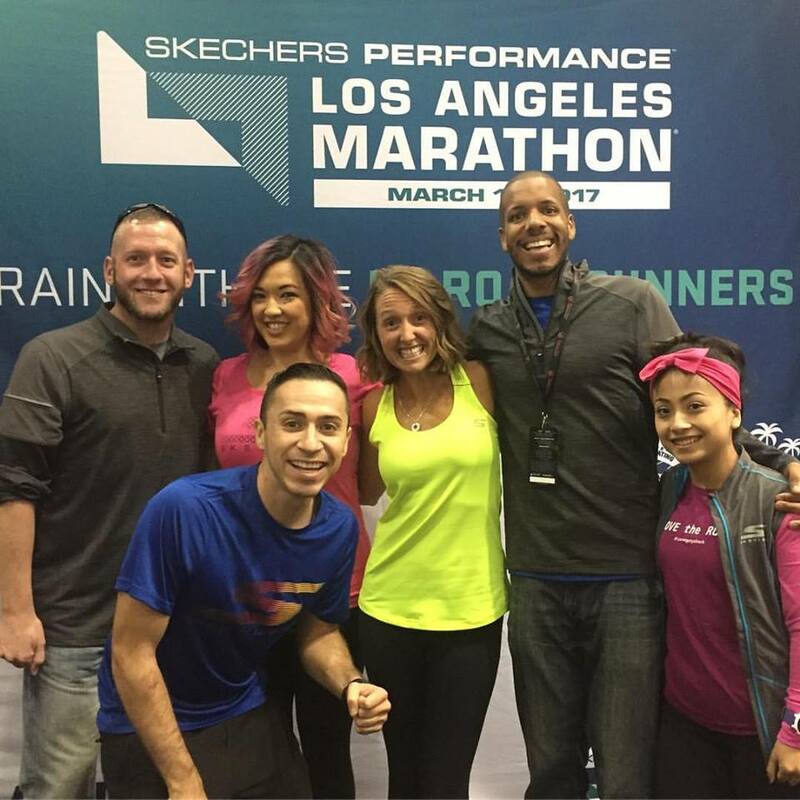 Jesus and Henry made sure to find me and chat for a few while I was getting everyone signed up for the 2017 Los Angeles Marathon! Thin crust is NOT my jam... but the hubby thoroughly enjoyed it! Eventually it was time to hit they hay (after watching some nail-biting college football and catching up on all of the highlights from the games we missed throughout the day). 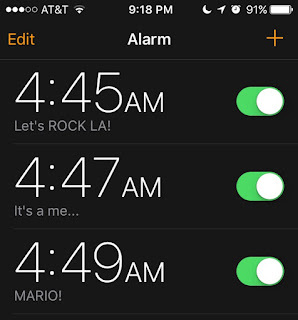 I set the alarms and we were off to dreamland. Oh yeah, our costumes... So since the #RnRLA Half is normally the weekend of Halloween, it turns into a giant costume race (great news for me, right?!). This year the hubby thought he would actually dress up with me (although he encourages my craziness, he has never really taken part before). I decided I'd let him pick the costumes (if he's willing to run with me, I'm willing to run his pace, so if he is willing to wear a costume, I will rock whatever he suggests). He said he wanted to do Joker and Harley Quinn... that was until he realized to do Joker justice he would need to run 13+ miles in complete face paint and opted out of that quickly! Thankfully I came up with the Mario Brothers idea shortly after that and we had most of the gear to make it work. and worked with the color scheme! Sunday morning we woke up, got ready and made our way down to the Magic Johnson statue for an impromptu #WeRunSocial meet-up and picture. The crew came out strong and the costumes were AMAZING! It was a little rough having to wait for the Staples Center to show a 'bright' commercial on the screens so that our photos were well lit, but, hey, sometimes you gotta work with what you got! With the race start time at 6:45am, we all dispersed and the hubby and I made our way to the corrals. I was seeded into the third corral and Ryan was in 12 - we compromised and joined Linzie in #9 (in case you haven't done a Rock 'N' Roll race before, your corral placement is notated by the first one or two digits on your bib... but there is zero monitoring so folks tend to start wherever they want). Short people problems... On my tippy toes to get in a picture with these two! After the fastest rendition of the National Anthem, we were off! The hubby rolled his ankle a couple weeks back (which limited his training for this last month) so we decided we were going to take it nice and easy. We would walk when we needed to, stop for 'character stops', chat with friends, you name it, it was fair game! Neither of us used the port-o-potties before the race (we were distracted with all of the amazing costumes), so decided we would jump into one of the 'real' bathrooms once we made it to the Coliseum. Around that time it started to sprinkle, but thankfully the rain stayed away until after we finished (although the humidity was out in FULL FORCE and that was NOT appreciated! #MotherNatureWasDrunk). On our way out, we saw a couple 'character' stops we wanted to make on the way back so made mental notes (creepy bear by the cheerleaders, chicka-flicka cow near the traffic light, etc). And unlike runDisney races, there were ZERO lines at the photo ops ;) It's sort of like people didn't realize these were character stops... weird! When we made our way back past the Staples Center we took a mini walk break to eat some PROBAR BOLT chews and for the hubby to stretch his ankle a bit. Even though we were taking the race easy, the first half seemed to fly by. after a less-than-stellar training cycle for the hubs! Well, once we made the turn on Olympic it seemed like a pretty steady downhill... which made me a little bummed... because I know, just as well as you do, that "what goes down, must go UP"! I guess I didn't look at the elevation chart ahead of time or else I would have seen that the second half was way hillier than the first... Oops! I wouldn't say that the course is super interesting... which is why I appreciate the out and back because cheering on fellow runners, looking for friends and handing out high-fives keeps me entertained. 'Local' races are great because I feel like I have so many friends out and about to say "HEY" to. Let me just say, DIY costumes are my jam... And Ivie and I can pull together some awesome ones in a short amount of time! Her sushi and soy sauce couples costume was my FAVE! Even with Ryan's bum ankle and us stopping for potty breaks, characters and walk breaks we still managed a great time - 2:18:56/57 (the hubby likes sprinting his brains out at the finish and ended up beating me by a mere second). We had a BLAST out on the course (mostly due to our AMAZING DIY costumes, the running community, etc)! I've gotta be honest though, RnRLA is probably one of my least favorite Rock 'N' Roll's that I've done (although, to be fair, I've only done San Diego, Seattle, Vegas and LA). The bling (and tees) are pretty terrible, the course isn't super exciting and everything sort of seems like an after thought... but when you can get a half marathon in SoCal for under $50 (I signed the hubby up when they were having a $45 sale), you've gotta gobble it up and then make the most of it! We did not stay for the concert (we hadn't heard of the band and needed to get back home for a pumpkin carving contest we were having later that afternoon), nor did we stick around to enter the costume contest, but I know the Rock 'N' Roll crew always puts on a good show, so I'm sure it was a rockin' good time! 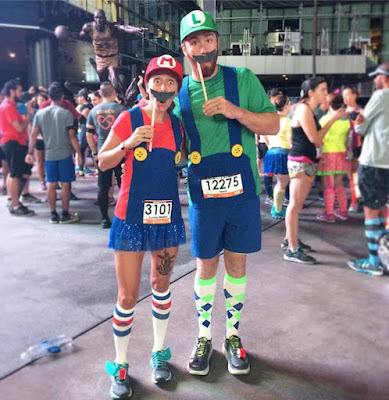 Have you worn a costume to a non-Halloween run before? I love your costumes! Cutest couple. I am always peaking for a race (like Revel Canyon City) around Halloween, so I never race in anything I get to dress up for. Wah. Perhaps next year! I agree with your assessment of the race. Its not exciting. The course was "ok" and the hills on Wilshire sucked. There should have also been more communication from them about comic con also going on at the convention center, people could have planned better. I thought the medal for the 5k was adorable (I did the half). And one of my biggest wtf, there was almost no finish line, like no big clock, banners, set up, etc. Just the run timing mat & photo guys in the crane. No hype, no excitement. 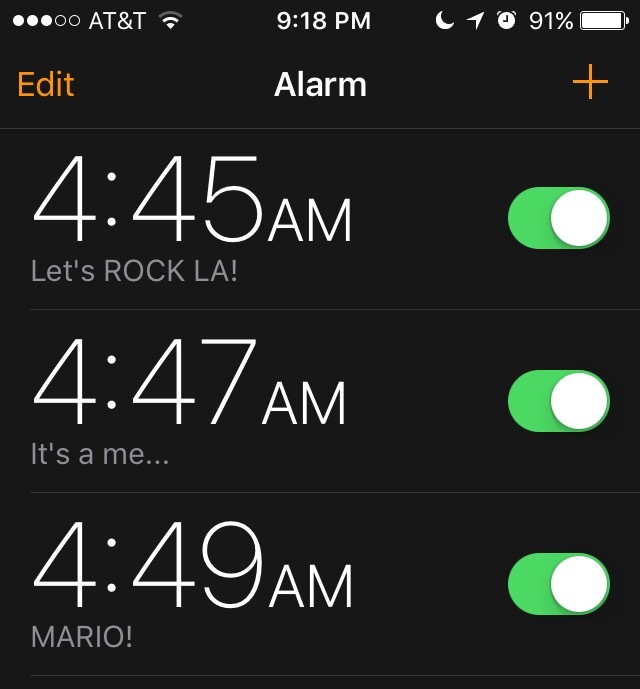 I told my husband on the way home I don't expect the LA race to be along much longer, it seems to get smaller every year and this year it all just really seemed like an after thought and not a priority race for rock and roll. (Which makes me sad - its the race that got me in to running 5 years ago - Sunday was my runiversary). You costume for the marathon is just adorable guys! I absolutely lovee it. Your costume runs are so much fun. Question: don't you get bothered by the props during your run though? Love your costumes. It is always fun running with the Hubby. 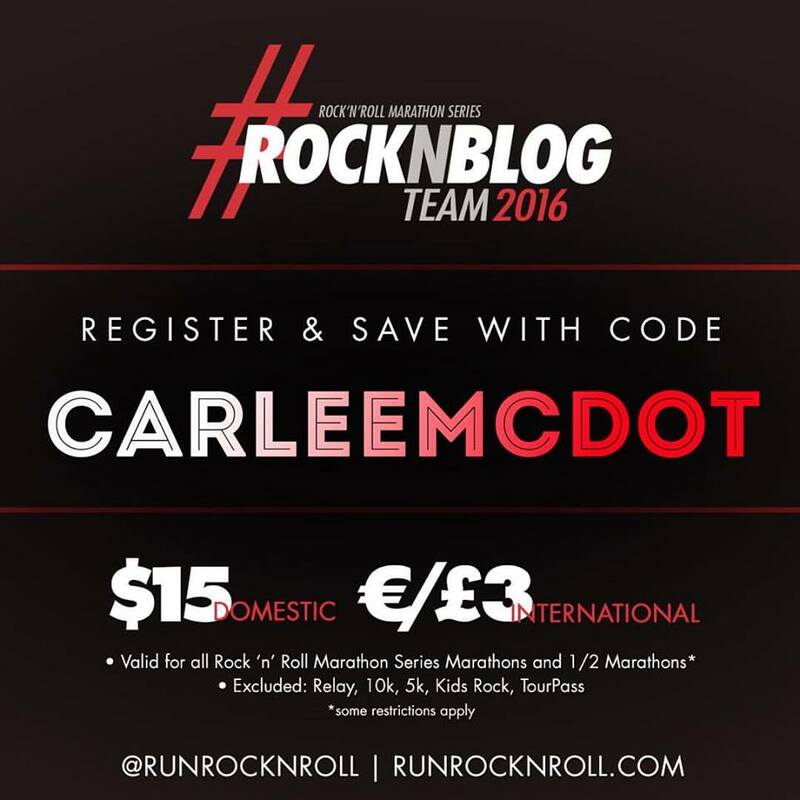 I have only ever done RNR Nashville (it is hilly and flip a coin on the weather). I need to try some more RNR (ones that are not in my backyard).